Kathleen Buehler: How do your works relate to the world we’re living in or to the reality we perceive? Would you say that you depict a possible different world or a world we can dream about, or that you are showing a reality that lies behind the everyday? 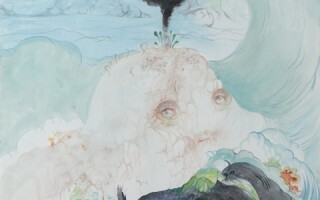 Vidya Gastaldon: You can look at my works as allegories. It’s possible to read, for example, many of the apocalyptic scenes I’ve drawn, with cities falling apart, as ecological or political fables that echo current anxieties about our future. Likewise, my ‘peaceful’ landscapes are more obviously tied to metaphysical notions, such as the promise of an Eden or something like that. Yet, these visions of peace also contain dark corners, a sense of hovering threat that permeates the whole landscape. I guess all the main metaphysical concepts I am working through have to do with a notion of non-duality. In Sanskrit it is called advaita. It is a concept that Western consciousness has a hard time grasping, a cosmic unity beyond good and evil. In the end, my work can be seen as an attempt to express advaita in the clearest possible way. Kathleen Buehler: It’s hard for us in the West to think in these terms. When I have to describe your work, for example, I immediately oppose conflicting elements. Vidya Gastaldon: Sometimes I’ll use a graphic shorthand to encapsulate theses ideas, such as Smileys with a teeth-filled grin, which signifies ‘The Cosmic Smile’, a divine acceptation of the state of things. Within my work, this kind of visual shorthand takes on an archetypal dimension. Of course, these grinning Smileys also evoke altered states of consciousness and popular drug culture: the Acid Smiley. Certainly, my experiences with psychedelic drugs were as important to me as my discovery of sacred Hindu texts. Kathleen Buehler: What also intrigues me is the way you are using eyes. Sometimes the eyes are empty holes and sometimes they are looking at you from the unlikeliest places. I imagine the eye with a pupil represents a more conscious way of looking, whereas the empty hole evokes a more physical perception. Are there differences to how you are using these eye motifs? Vidya Gastaldon: Eyes come out of matter to express the presence of spirits. They almost have a will of their own. In the past, people have ascribed varied psychoanalytic interpretations to their presence. I think of them more as a manifestation of an all-seeing presence, an all-encompassing consciousness. Kathleen Buehler: Well, it’s a powerful image, a sense that nature is looking back at me in your paintings. Your paintings are generally vibrant with color and energy, explosive and cheerful. For some people this may look like kitsch. What does beauty mean to you and how do you react to critics who might say your work is kitschy? Vidya Gastaldon: It’s a bit like answering people who think that the fairy tale-like character of my work implies that I am working for children. I don’t. But that doesn’t mean I have anything against children, just as I have no problems with kitsch. Kathleen Buehler: So you are comfortable with kitsch? Vidya Gastaldon: Kitsch has something to do with design and fashion; it’s a good taste vs. bad taste question. I understand that artists find this to be a productive locus of discussion, but I’m not really interested in this discussion. I’ve seen particularly baroque drawings of mine hung in a hyper minimal and designed living environment, and no one seemed to mind. Take a look at contemporary popular Indian painting, air-brushed representations of the gods of the Pantheon. To our Western eyes, they are really tacky but there, they exist right alongside classical ‘beautiful’ sacred architecture. I’m also fond of certain cartoon characters, like Barbapapa or SpongeBob, for their aesthetic qualities as much as for their allegorical power. 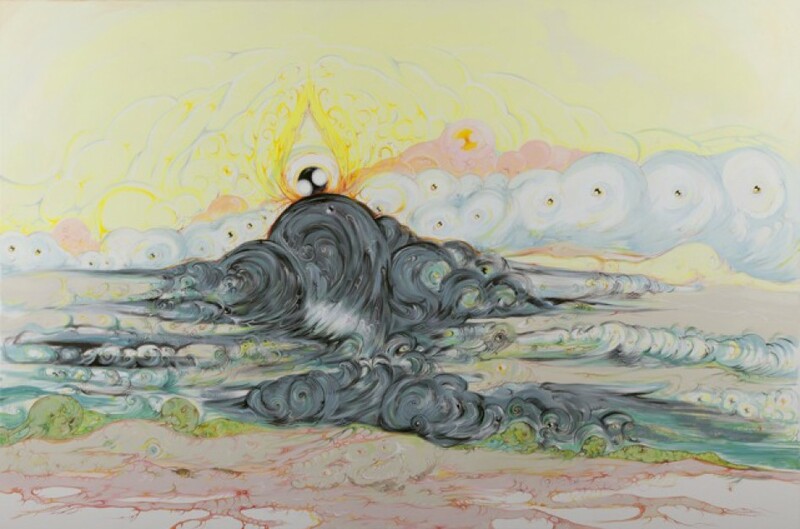 Kathleen Buehler: Your way of painting and drawing is changing. Before it was more transparent, as if the transparency would counterbalance the more kitschy aspects of your work. In the new paintings you use oil and acrylic, so it’s less transparent. But you are also dealing more with earth and soil in your recent paintings. So it’s more about matter than air, and the color in a way organically changes to a thicker substance, too. Vidya Gastaldon: This probably also has a link to my current life on a farm with a vegetable garden. And some of these new works are also more directly linked to cartoons and certain strands of post-war Expressionism as well as ’80s Neo-Expressionism. Kathleen Buehler: Again, you painted a cabbage with eyes. This is fascinating because we eat cabbages and never think of them as having eyes and being alive. Vidya Gastaldon: It has to do with an acid trip I did when I was nineteen. I hadn’t eaten properly for a long time and was due to take a flight later in the day. A friend persuaded me to eat a vegetable salad while I was still high. I started to eat it and talked to every bit of vegetable. I explained to them the journey ahead of them within my body, how they would transform into energy and return to the earth, before coming back as another life form. I talked to these vegetables for an hour. These experiences have partly shaped my consciousness and my way of looking at the world.